If you loved Toy Story 1, 2, or 3 (or all of the above) as much as we did, then you will love Toy Story Land. 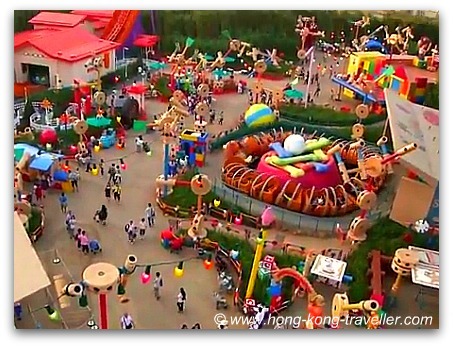 This is the fifth Land to open at Disneyland Hong Kong and here you will find Andy's toys welcoming you at their play yard with three new exciting rides. 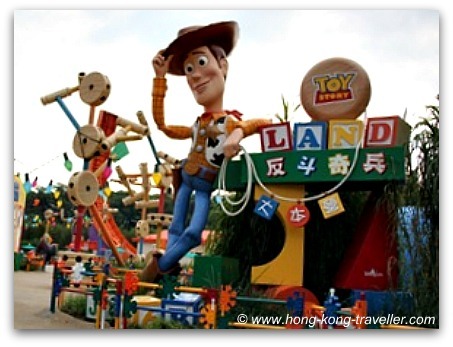 The theme is of course based on Pixar's Toy Story movie series, and in this fun backyard you are surrounded by tinker toys, soldiers, blocks, alphabet letters, monkeys and naturally, all of Andy's friends, Woody, Buzz, Jessie, Rex, Bullseye, Hamm, Slinky, Mr. and Mrs. Potato Head... you get the picture... will make an appearance in some way or another. This new land is located in the western side of the park, tucked between Adventureland and Fantasyland, just outside the rail road track loop. 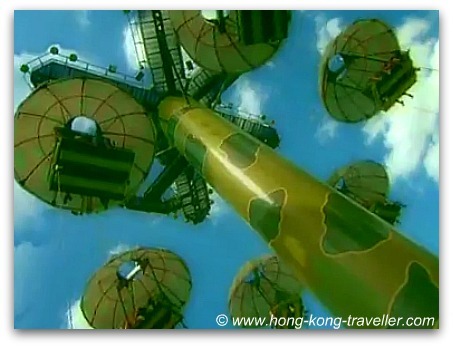 It is the smallest of all Disneyland Hong Kong Lands but there seems to be a lot of room for expansion. 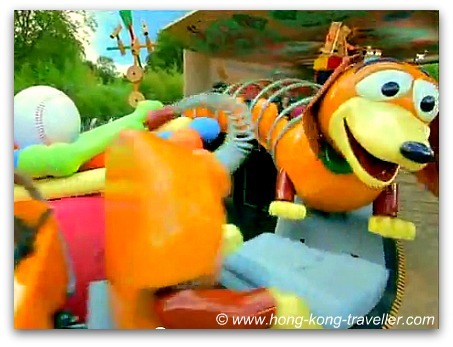 There are three new rides at Toy Story Land which are a welcome addition to Disneyland Hong Kong's theme park. Soldiers are the recon masters in charge of reporting the new presents (Christmas or Birthdays) that Andy and Molly get. They climb and hide on a plant or the Christmas tree to carry out their mission. Toy Soldier Parachute Drop will lift you to the sky and then drop you as you parachute down as Andy's Green Army Men did in Toy Story 3 when they parachuted out the window. A troop of Six Soldiers share one parachute. Young soldiers must be 81 cm. (2'8") to be able to parachute down, and if under 7 years of age must be accompanied by a senior soldier that is at least 16, or be at least 137 cm. (4'6") tall. Slinky is Andy's springy dachshund toy that stretches, coils, tangles and untangles... and here, he spins and chases his tail, taking you along for the ride. To go for a spin, you need to be 137cm (4'6"), older than 7, or go with someone 16 or older. Remember Woody racing on RC like a rocket to catch up with the moving truck on Toy Story 1? 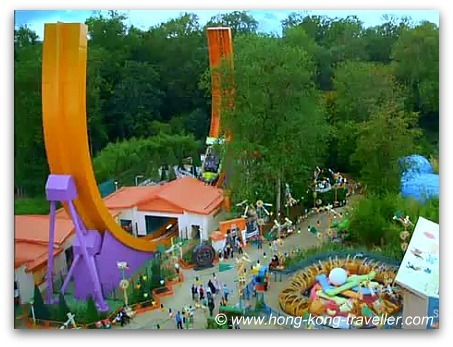 That's what RC Racer is, it's a shuttle coaster that whips you up and over the U-shaped rails, as it launches you back and forth on a dizzying thrilling ride. Racers must be 120cm (3'11") tall to ride on RC. 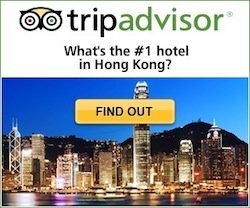 If you are under 7 you need to be with a 16 year-old or older, or be taller than 137 cm (4'6"). In addition to the rides, you will also see Cubot running around the land, a three-part cube robot, that you can play with and spin and mix the different cubes to form your own robot. Barrel of Fun is where you head to find Woody, Jessie and friends who will be posing for pictures with you. Enjoy your play time at Andy's backyard!